I headed over to Kybecca this afternoon for their Saturday tasting to try the Schneider-Brooklyner Hopfen-Weisse. While I was there I picked up a six pack of Hop Head Red Ale from Green Flash Brewing Company of San Diego. I had read about this beer earlier in the week on the Kybecca blog. The beer was described as "a cross between a red ale and an India Pale Ale." Matt's description intrigued me as an unabashed hop head, and since we don't see Green Flash beers stocked locally very often, this was a chance to try another beer from this brewery. This is a fairly new beer and is not listed in the brewery's web site. 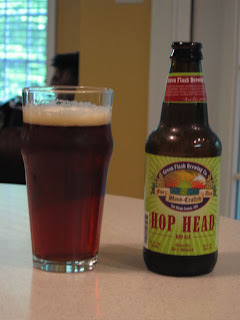 Green Flash Hop Head Red Ale pours a red-brown color with a thick head that leaves lots of sticky lacing as it fades. It certainly looks like a typical red ale, but that is where the similarity ends. The brewer dry hops with Amarillo hops giving the beer a strong citrus aroma and flavor. A bit of pine hits those senses as well. The hop profile is significant but the beer is still balanced with enough malt sweetness to keep things in check. There is some lingering bitterness, and a slightly oily mouthfeel. At 6% ABV it's a little high for a session beer, but still quite drinkable. I was somewhat reminded of Tröegs Nugget Nectar, another highly hopped American Red Ale. However, Nugget Nectar has a stronger malt backbone, whereas the Green Flash has a much stronger citrus profile. That stereotypical East Coast - West Coast difference perhaps? Despite the well-publicized hop shortage, American brewers are still managing to create intriguing beers for hop fans. We enjoyed another interesting hop-tweaked beer a couple of months ago in the Amarillo Black Ale from The Church Brew Works in Pittsburgh. For this one the brewer tweaked an American Stout recipe, also with Amarillo hops, to create a cross between a Stout and an IPA. The terms dry hop and fresh hop are both used to describe addition of hop blossoms near the end of the fermentation. This can add significant hop flavor and aromas to the finished beer. Some brewers add the hops to the beer immediately after they are harvested and brewing schedules are planned to coincide with delivery of the new harvest. The technique seems to be gaining popularity. Sierra Nevada recently announced an expansion of their fresh hop Harvest line, adding two new variations to the original Harvest Ale. Whatever the reasons for the growth in the use of the process, I'm confident we'll continue to see new and interesting beers from American brewers despite the ongoing hop shortage. Matt described this beer to me as nicely balanced, but I think the hop profile is a tad too strong for a red ale. It's a fine IPA though. I still prefer Nugget Nectar. Nugget Nectar is still king in my book too. I wonder, would NN's appeal lessen if it was a year round beer?